Think about putting together a grey statement shirt, a pastel pink faux leather skirt, a velvet pearl choker and massive pink sunnies, and it seems like the worst outfit ever. Nevertheless I decided to combine all these items, and the outfit came out perfectly. A new favourite even. 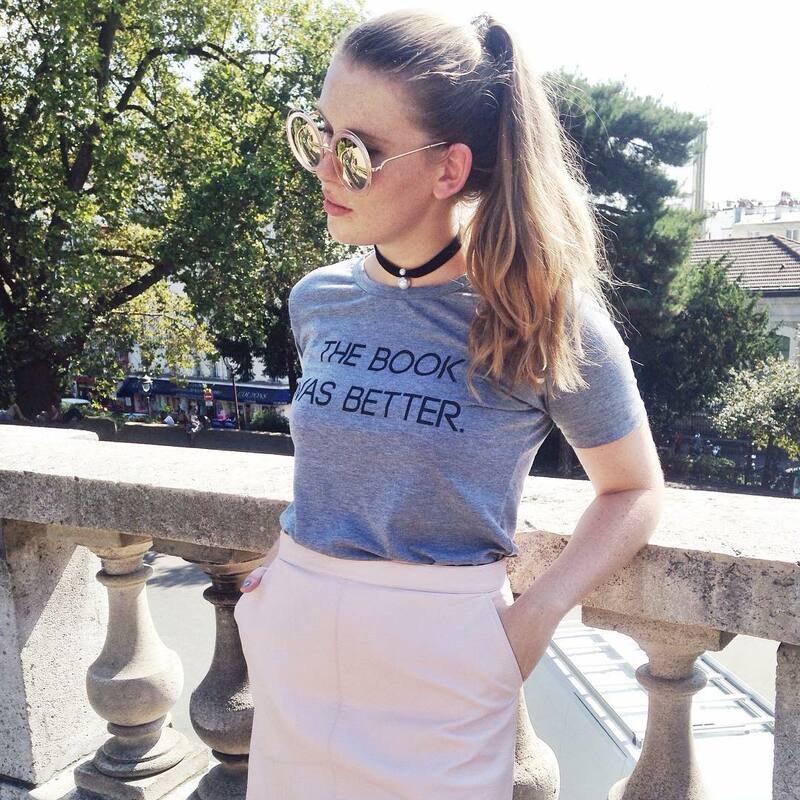 The shirt is from RoseGal, and I couldn't agree more to what it's saying - being a massive bookworm, I must admit that I've only come across one single book of which the movie was better, that being Breakfast at Tiffany's. There you. Accessories are from Zaful - so happy to have found the perfect velvet choker with an elegant pearl details, and these massive pink sunnies that just seem to have been made for me. Top that off with a Parisian backdrop and a sunny day and I'm on cloud nine. What do you think about this big mix & match? And do you agree to the quote on my shirt? Ever come across a movie better than the book? Let me know in the comments! I am loving this look! You look super cool. Those sunglasses, ah! I love that leather shirt! Love this look! I love this top, my friends got it for me because im constantly banging on about books being better than their films, one of my faves! Amazing outfit - so chic! This tee is so cool! I love the slogan! I love this look!!! That top, skirt and sunnies are so perfect! OMG I am obsessed with those pink sunnies! !